NECKLACE - SARAH COVENTRY. 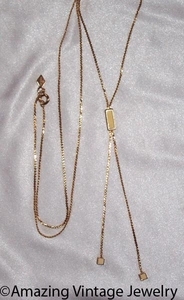 "FINESSE" LARIAT FROM 1980. 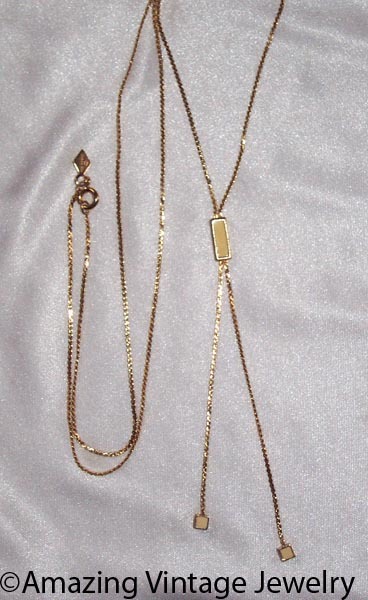 THIN, DELICATE GOLDTONE CHAIN WITH RECTANGULAR ACCENT AND SQUARE END TIPS - BOTH WITH CREAM ENAMEL ACCENTS. ABOUT 27 1/2" LONG PLUS THE 4 1/8" RECTANGULAR PORTION AND CHAINS BELOW. EXCELLENT CONDITION.